I’ve now soldered the two chromosome arms together, and added a spiral of silver wire to hold the necklace when I get round to ordering thicker wire that won’t bend too much when worn. 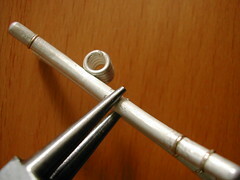 The gold rings are all cut to size and filed, it only remains to solder them on. I’m quite pleased with the results; it certainly looks better than I thought it would. My only grouse is that I’ve marked the silver arms while fitting the rings on. No worries, nothing that a bit of emery paper won’t sort out.